Monday, March 24, 2014, The missing Malaysia Airlines Flight MH370 has been found officially as confirmed Prime Minister Najib Razak (Assumed only according to latest news). The jet crashed in the Southern Indian Ocean, in a remote location near West Perth and no one survived. Tears and cries of unmeasurable pain and loss echoed from a Beijing hotel ballroom as the relatives of MH370 227 passengers learned about the bad news. These were based on ABS-CBN news. Its been more than two weeks (16days) of search and the 153 Chinese passengers on board the aircraft died on plane crashed leaving a big question, "how did this happened?". The MH370 vanished without warning on March 8, 2014 while flying over the South China Sea with its route from Kuala Lumpur to Beijing with 227 passengers and 12 crew on board. It was published on the news last March 15 that, the missing Malaysia Airlines Flight MH370 was Intentionally switched off its communications and change its course by someone skilled and competent on board before the aircraft disappeared as said by senior Malaysian military official. But those are just theories due to absence of firm evidence. It is still unclear why the plane ended up over the southern Indian Ocean. The investigations is still on going about the missing MH370. In behalf of this blog authors, we give deep condolences to all families and friends of the lost passenger of MH370 and will pray for justice for them. 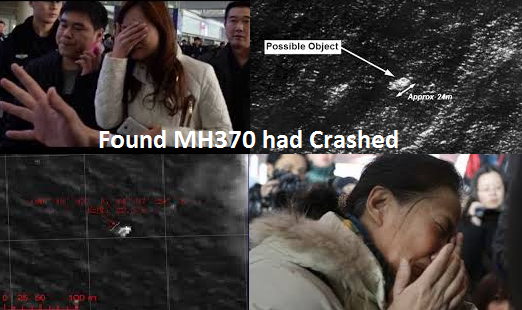 The search still on going due to fact that there is no recovered dead bodies nor debris of crashed MH370 yet.